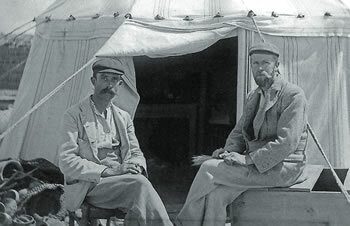 In 1896, two young English archaeologists, Bernard Grenfell and Arthur Hunt, excavated at the Egyptian city of Oxyrhynchus on a branch of the Nile. They found the rubbish dumps that had been used by the citizens of that city from the 1st to the 6th Century AD. The dry climate of Egypt meant that thousands of pieces of papyrus had survived since that time. There were piles of accounts, bills, correspondence, shopping lists and all the multitude of written records a thriving city generates. They found so much material that it is still being analysed and studied today. A significant portion of the city’s population had been Christian so there were scraps of bible texts, apocryphal gospels and liturgical books among the myriad of documents. The photo to the right of this page shows one such scrap from a rubbish tip of Oxyrhyncus. 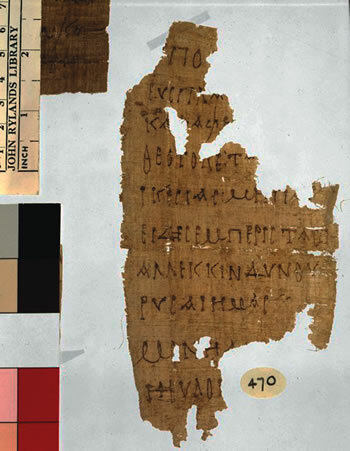 It is now in the Rylands Papyri Collection at the University of Manchester, and is known as P. Rylands 470. It is roughly four inches by seven inches in size. One problem with little scraps of text is dating them accurately. Like many manuscript fragments the date of P. Rylands 470 is disputed. The University of Manchester suggests it was written in either the 3rd or 4th century. It appears to be a private copy of a hymn from the Coptic Christmas liturgy. It could be someone in the choir, having to learn up the words, wrote out their own copy on one side of a leaf of papyrus. The Copts were Greek-speaking Christians and the text on the fragment is in Greek. It was easy for the archaeologists to translate because the same words are still used in liturgy as a hymn and a prayer. We know it in Latin as Sub Tuum Praesidium and in English as We Fly to Your Protection. The Greek of the bold text is what is on P. Rylands 470. That scrap of papyrus is likely to be our earliest physical evidence of a prayer to Mary, and amazingly it is a prayer that we are still saying. Intriguingly, the prayer contains the title ‘Mother of God’ (Theotokos in the Greek) and is evidence of the use of that title before the Council of Ephesus in 431 AD. The title was disputed in that Ecumenical Council with some bishops preferring ‘Christ-bearer’ to ‘God-bearer’ because the latter made Mary sound like a goddess. The majority of bishops at the Council affirmed that the intent of the title was to affirm the divinity and unity of the person of Jesus who was born of Mary. There was a flowering in devotion to Mary, and of use of that title, after the Ecumenical Council declared it to be orthodox and appropriate. In number 197 of the 1872 Constitutions written by Fr Colin he instructs Marists “To implore the help of her protection, let them recite the Ave three times and Sub tuum once on rising in the morning and retiring in the evening.” He, and we, are part of a very long tradition of Christians flying to Mary’s protection.